Thursday Post ~ Photos, Art and More Photos ~ Last night we had storm warnings and yesterday the winds were rather strong but temps were in the seventies. ArtMuse Dog and I took a walk to grab some pre-storm photos. 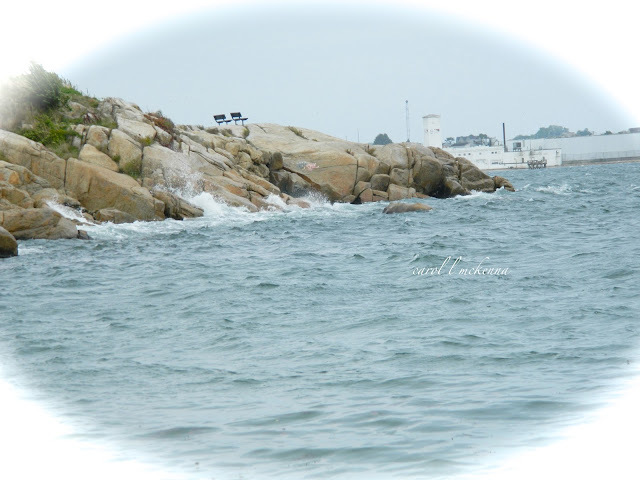 On Cape Ann, I learned to watch the ocean for signs of 'weather' coming. As a child, my creative spirit, used to love her camera and her paints. I would beg my parents to let me out to go take pictures with my little camera. So here I am still today having a wonderful time feeding my creative spirit with photo walks with ArtMuse Dog. The rainbow photo was taken this summer but is for Alpahbe Thursday who's prompt was the letter 'R'. The storm photo is for Rural Thursday and Two Bears Farm as I love to share ocean shots in order to see the more rural and farm shots. It makes me realize how very diligently farmers work the land and many hoping to make their living from their products. Although their photos look romantic, I know they work very hard. The photography is also for Creative Everyday which I try to be 'creative everyday'. Wishing you a wonderful Thursday. Lovely shots! I miss the ocean.. I love all the ocean shots you share with us! The rainbow is beautiful. how beautiful! it's too bad I don't see that many rainbows where I am, so thanks for the photo. Yes, that first picture does remind me of MA. It must be starting to get cold up there. Beautiful photography. The rainbow sink into the ocean. The water is then a great rainbow. Love the rainbow ... good shot !!! I like those benches there on the rocks! Great shots. What a beautiful capture of that rainbow! very pretty -- how I miss the ocean! enjoy those strolls with your little buddy. I love the storm shot, and the rainbow is gorgeous too! I love the HUGE rocks with the tiny two little chairs on top. Great capture. Thank you and Art Muse Dog for sharing these incredible photos. Have a great day! Beautiful rainbow shot over the ocean! What nice walks you get to take with your cute little dog. When the kids were down here in June for our family vacation on Jekyll, my oldest son and I saw something that I have never, ever seen--7 rainbows all together. It was just amazing. Great photo, Carol! We need more rain here for sure. I want to see some rainbows. 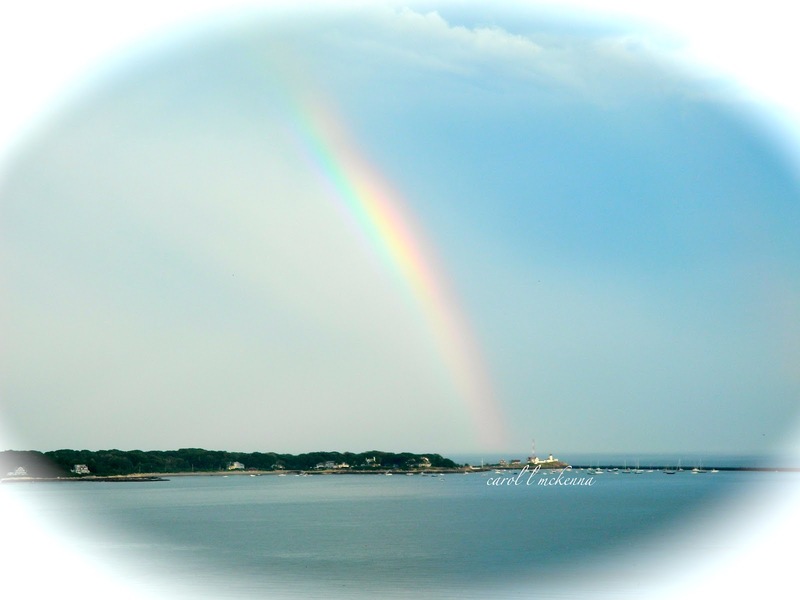 Your rainbow photo is gorgeous! Almost looks like the aurora borealis! I want to sit on one of those benches and look out to sea and dream! Beautiful rainbow and beaches. Lovely and evocative. I would love to be sitting on that beach, bundled up and watching the waves crash! You got some amazing captures! The rainbow is really breathtaking! Thanks for sharing your lovely view!